Four years ago I completed an item on my bucket list without even realizing it. In 2009, I danced in the Sydney Gay and Lesbian Mardi Gras in a speedo and body paint. Let me tell you what courage is… being half naked in front of 300,000 people. It also, strangely enough, was a fulfilling experience. Taking my fear and staring it right in the face. Also, after four months of starvation and a carb-less diet, it felt great to put myself out there. I will have a separate blog post about that. 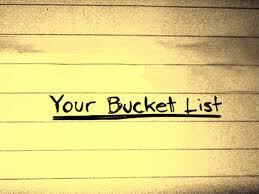 For now, here is my bucket list. Note that I have already taken off anything I have already achieved. In one year, I will revise the list. * Items that are crossed out have been completed.